ESTERO, Fla. - The first-place Florida Everblades (12-5-4-0, 28 pts.) begin a two-game series with the Greenville Swamp Rabbits (9-12-3-0, 21 pts.) on Friday night at Hertz Arena, aiming to extend their season-high point streak to 10 games. 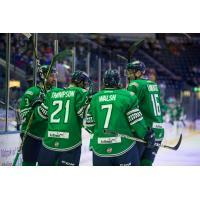 With a 3-2 win over Jacksonville on Wednesday, the Everblades jumped the Icemen for the top spot in the South Division. Trailing 1-0 at the start of the third period, Florida scored three times in the third to pick up the come-from-behind win. Zach Nastasiuk tied it for the 'Blades, and Joe Cox scored the go-ahead goal at the 12:43 mark of the third. Nathan Perkovich added an empty-net score that proved to be the game-winning goal. Joe Cox (FLA) - Cox finished with a plus-minus rating of +2 on Wednesday night, the seventh game this season where he has been a +2 rating or better. The second-year forward leads Florida in scoring with 23 points (10g-13a) and is second in the league in plus-minus rating at +18. He was the AMI Graphics ECHL Plus Performer of the Month for November after finishing the month as a +15 rating. Michael Pelech (GRN) - Acquired in a trade with Utah in July, Pelech leads the Swamp Rabbits in both assists (14) and points (22). He has two game-winning goals this season, both of which have come in the current three-game win streak for the Swamp Rabbits. Friday is the first of 10 meetings between the two teams this season and the 90th all-time matchup. Florida holds a 43-31-15 record against Greenville and posted a 5-0-0-2 record against the Swamp Rabbits last season. After dropping the first two meetings last year in shootout fashion, the 'Blades then won the final five meetings. Florida's nine-game point streak is the longest active streak in the league and the second-longest total in the ECHL this year. Only the Toledo Walleye's stretch of 11 consecutive games with a point from Oct. 20-Nov. 17 is longer. In putting up 48 shots on goal on Wednesday, Florida set a new team season-high for a game this year. That shots on goal total was the 'Blades highest since they put up 53 shots on goal in a 4-3 overtime loss to the Swamp Rabbits on Feb. 2, 2018. In addition to blitzing Jacksonville with shots on Wednesday, Florida was also strong in suppressing the Icemen offensive attack. The 'Blades permitted a season-low 18 shots on goal to eclipse their previous season-low of 22 shots on goal against. Florida had twice allowed 22 shots on goal in a game, with the most recent occurrence on Nov. 30 against South Carolina. Florida has earned two wins this season when trailing at the start of the third period, and both victories have come against Jacksonville. The Everblades are 2-5-1 when facing a deficit after 40 minutes but 2-1-0 in that situation on home ice. Florida is one of just two teams in the 27-team ECHL that has not lost in regulation when scoring first this year and is 6-0-3-0 in such games. Tulsa (9-0-1-1) is the only other team without a regulation loss in games it has scored first. Hertz Arena has proved to be a tough venue to play in for opposing teams this season. Entering Friday, Florida has lost just once in regulation on home ice, a home-opening 1-0 loss to Norfolk on Oct. 19, and has points in eight straight home games since then. Only the Cincinnati Cyclones, which have points in 12 straight at home, have a longer point streak at home this season. Friday's contest features a stark contrast when it comes to success in the second period. Florida leads the league with a +13 goal differential (27gf-13ga) in the second period this year, while Greenville is last in the league in that category and has been outscored by 21 goals (18gf-39ga) in the middle frame. Greenville is the only South Division foe the 'Blades have yet to face this season. When meeting a team for the first time this year, Florida has a record of 2-4-0. Greenville has fared better at home this season than on the road and has scored an average of just 2.25 goals per road tilt while allowing more than four goals per road game. The Swamp Rabbits are 5-5-2 at home and 4-7-1 on the road. The penalty kill has been a point of concern for Greenville as it has the second-lowest conversion rate in the ECHL entering Friday night at 74.0 percent (77-for-104). Florida goaltender Jamie Phillips has fared well at home this season and has earned victories in all four of his starts. The Michigan Tech product has a 1.50 GAA and a .946 save percentage at Hertz Arena and has allowed two goals or fewer in each game. He helped key the series victory against the Stingrays as he yielded just three goals total in a pair of wins. Florida finishes off the six-game homestand and two-game set with Greenville on Saturday night with its annual Teddy Bear Toss presented by Florida Community Bank.